There’s no much flowers that can be seen around Soekarno Hatta Airport (Jakarta, Indonesia). I just can share here: Bougainvillea / paper flowers and Mussaenda erythropylla (botanical name). 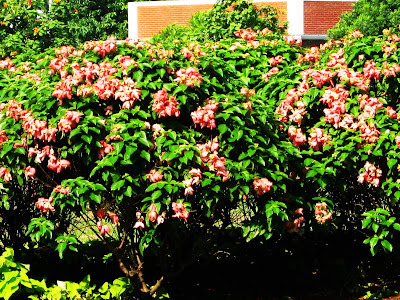 We, Indonesian people, identify Mussaenda as Nusa Indah flowers. I don’t know its common name in another country. Such pretty photos, lovely flowers. Thanks for sharing and have a great week. I love the first shot - beautiful! They are beautiful flowers! Great shots. Wonderful colours! I favorite the first picture. 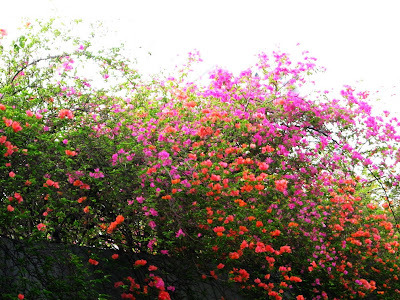 The colours of the bougainvilleas are stiking. In Malaysia, we call Mussaendas - Bunga Janda Kaya or rich widows! yes, i agree, those bougainvilleas were amazing. love the display of colors:) have a great week. Such beautiful blooms. Great captures. So colourful!I think Bougainvilleas can grow in any environment.I also saw a lot of blooms here.